The Liberty Series Committee remained active this year, with most communication via the Liberty Series Yahoo! Discussion Group and personal emails. The discussion group has grown to 87 registered members. No major finds were reported, although some very nice usages have appeared. Auction sales of Liberty series material continue to increase in both number and value. 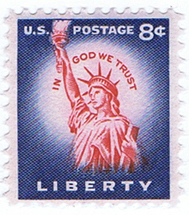 Member Tony Wawrukiewicz continues to write about Liberty series usages in his monthly “Modern U.S. Mail” column in Linn’s Stamp News. We continue with the ongoing project to document earliest usages of the dry printing varieties. This year we finally established an EDU for the dry-printed 6¢ value, which has been one of the most difficult. A Liberty Series exhibit won another Grand Award: “Single and Multiple Uses of the 1954 Liberty Series 2 Cent Thomas Jefferson,” by Roland Austin, at the Rocky Mountain Stamp Show: single frame, Gold and Grand Award.